All Virginians should support Creigh Deeds, but here are some answers to progressive Northern Virginians who might ask why they should work hard to elect Creigh. He works for the people. Creigh is the real deal – he is honest, genuine, and sincere. He is an experienced prosecutor and state legislator who has built his career as a consensus builder who delivers results. Creigh will serve Northern Virginia well. 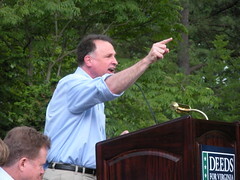 He understands education, transportation and other NoVa concerns, as the Washington Post recognized when it endorsed him. Moreover, he has represented people like you. Creigh comes from rural Bath county, but his state senate district includes Charlotesville – a progressive, urban area (78% Obama vote). The last eight years – the Warner-Kaine years – have brought Virginia fiscally sound government, a commitment to diversity, new investments in education, improvements Virginia’s mental health care system, and a commitment to smart growth and real transportation solutions. We need a Governor who has worked with those administrations to move Virginia Forward. He will create jobs, including green jobs. For example, Creigh plans to help workers and small businesses with tax credits for job creation, provide loans to new small businesses, fund job training, and provide community college loan guarantees. He will make Virginia a leader in green jobs through R&D and renewable energy standards. Creigh will protect the environment. He worked to clean up the Kim-Stan landfill Superfund site and wrote one of the most progressive laws to preserve open space. 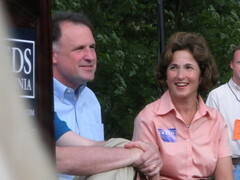 The League of Conservation Voters gave him a 91% rating – the 2nd highest rating in the State Senate. He is committed to protecting all Virginian’s rights. Creigh is pro choice and has been endorsed by NARAL and Planned Parenthood. He has been a solid supporter of restoration of voting rights to non-violent felons who have done their time. Although he did vote to put it on the ballot, he voted against the Marshall-Newman Amendment in November and he opposes all forms of employment discrimination. Creigh is dedicated to political reform. Creigh led the fight to establish non-partisan redistricting, an effort House Republicans defeated. Independent-leaning voters should recognize that Creigh is dedicated to bipartisan public service for the public good. In fact, Republican former General Assembly members have endorsed him. President Obama wants you to. He wants a partner in the Virginia governor’s office and he continues the campaign for change. The 2009 election is the first battle of the 2012 election and some will view it as a referendum on the Obama presidency. The best way to support President Obama is work to elect Creigh Deeds. We need a sweep. Creigh leads an excellent and unified ticket with Jody Wagner for Lt. Governor, an experienced leader in state government, and Steve Shannon for Attorney General, and experienced prosecutor and legislator. Electing Creigh at the top of the ticket will also help elect Democrats to the House of Delegates. Electing Democrats this fall is important – otherwise, the bad guys win. Cuchinelli is the most outspoken of the GOP trio, but McDonell and Bolling are George W. Bush/George Allen/Pat Robertson/Sarah Palin Republicans as well. We can’t let them take Virginia backwards. Okay? Now go to DeedsforVirginia, sign up to help, contribute, and join Creigh and President Obama on August 6th at the Rally for Virginia. Thanks.